Posted April 29, 2014 by Sage & filed under Human Interest, Yoga. For the last few days, a robin has been attacking its reflection in the window to my home office. Over and over again, it flings itself at the window in a show of aggression. I’ll shoo it away, and a few hours later it returns. One of my students suggested I Google “robin totem”—it seems the robin, harbinger of spring, is a symbol of change. That’s ironic, as this bird is not changing its behavior. Its now-habitual action is causing it harm. Read the full post here—it goes on to talk about the Safari web browser and the forest singletrack, which is muddier than ever this year. Today, a robin appeared ready to fight itself in the front-porch window. This time, I knew how to react, remembering what, after several days of struggle, worked well last year: a distracting mylar balloon, floating in the breeze but tethered to the porch swing. There are a few yoga lessons here. One, I had to go through several failed strategies before landing on this one that works: papering over the windows with the New York Times Mutual Fund Report (was I aiming to bore it into leaving? ); trying to recondition the bird by running outside yelling every time it appeared. I learned through trial and error, and without the error, I wouldn’t have had success (save for asking a seasoned teacher). Two, so often our minds are like the robin: obsessed with our own image, fighting ourselves, repeatedly flinging ourselves against the glass in a destructive pattern. A gentle, non harmful barrier can be enough to turn us away and toward more positive behavior. 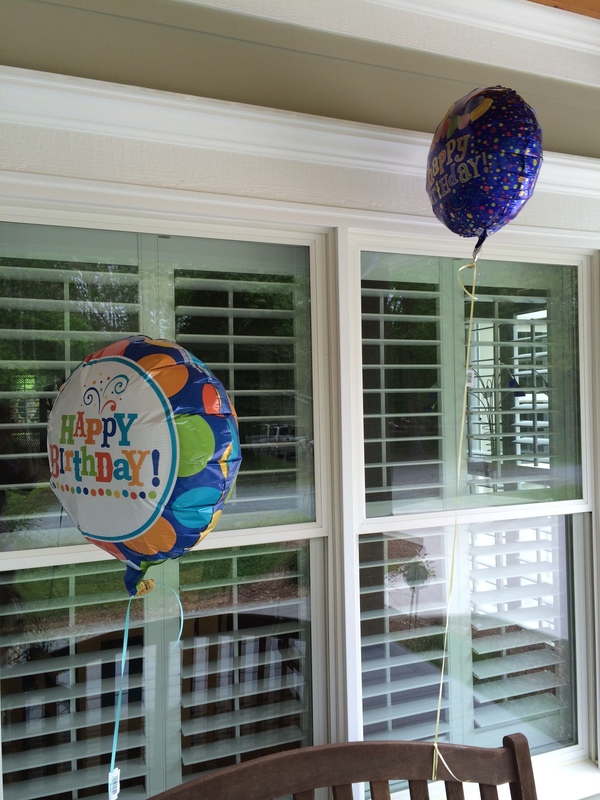 Three, the balloons, which currently dance outside my office window, are a beautiful focal point for practicing dharana: single-pointed concentration. When I feel distracted or hit a dead end in writing, I can glance up and sharpen my focus, watching the balloons and linking my mind to what’s happening right now. If you don’t have balloons handy, use your breath. Give it your full attention. You’ll come away from even a few rounds of watching your breath feeling clearer and better connected with your body and mind.